During a long winter run, while listening to music on my iShuffle, I started thinking about the connection between architecture and music. 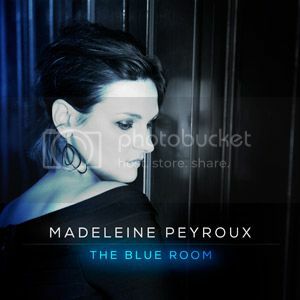 Specifically I was listening to Madeleine Peyroux's latest album The Blue Room, an album that I appreciate more and more with each hearing. One can not help but be captivated by the raw emotion in Peyroux's voice. The jazz vocalist's phrasing skillfully dances around the melody. The music sounds new and refreshing, but the album is really a collection of songs that influenced Peyroux when she was young. The songs are reinterpretations of songs that were recorded in 1962 by Ray Charles. When Charles released his album he was singing a collection of songs that were written and recorded years or even decades earlier. Like Peyroux, Charles put his own spin on the songs in his collection. And like Peyroux, Charles' reinterpretations sounded new. His album is aptly named Modern Sounds in Country and Western Music. If you did not notice the album title, you might not have guessed that the origins of Charles' selections had their origins in the Country and Western genre. Charles' rhythm and blues groove shows through, just as Peyroux's jazz stylings do. Despite very different reinterpretations, however, the roots for both artists are the same. Let's look at one of the songs common to both Peyroux and Charles, Break These Chains. This song was written and first recorded by Hank Williams in 1953. It quickly rose on the charts, all the way to number one. The lyrics are masterful, even timeless. It is not surprising that both Peyroux and Charles remain faithful to the lyrics in their versions. Charles slows down the pace a bit and replaces Williams' simple guitar picking and classic country crooning with a choir and orchestration to back up his soulful voice. Peyroux keeps the pace as brisk as Williams and adds strings and a piano, but it is her sultry voice that carries her rendition. All three artists suspend the vocals and add an interlude all their own. Williams picks his guitar, Charles tickles the ivory, and Peyroux showcases her small jazz band. Architecture, like music, is a manifestation of what is inside the creative mind. A good case study of this connection can be realized in the work of Hugh Newell Jacobsen. The Fletcher House in Nashville appears as a collection of modern vernacular buildings on the landscape. It is new and fresh, crisp and formal, radiant white and devoid of ornamentation. This is definitely a modern house, but without the coldness and starkness that characterizes so many modern houses. There is something different about Jacobsen's houses that's hard to identify. There is something strangely familiar, a lineage. 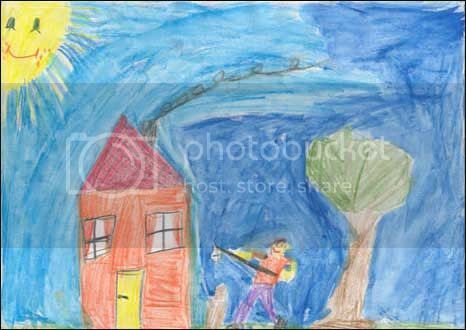 One of the first works of art to adorn the young parent's refrigerator is a rendition of a house, a sun, and a tree. The house is often a simple rectangle topped with a triangular roof and punctuated with square windows. 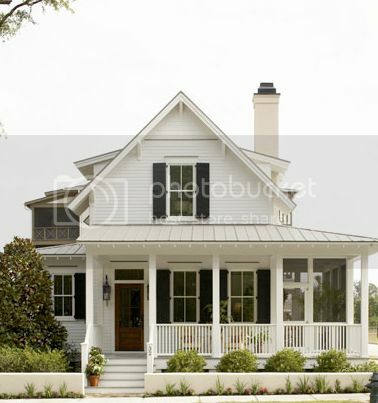 This image is not necessarily a representation of the child's own house but rather a result of the constant bombardment of classic american houses images. Jacobsen takes the classic house form and reinterprets it. 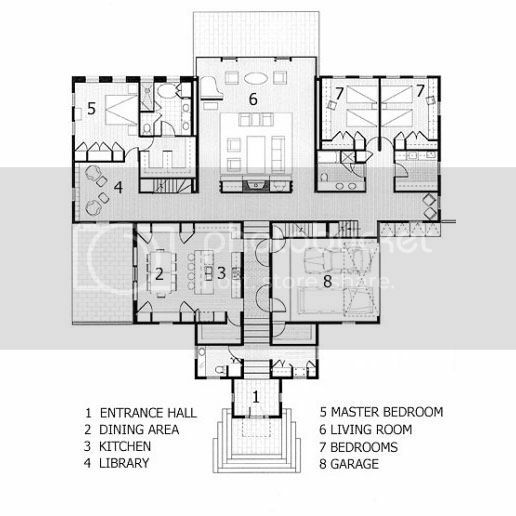 With a keen modern eye, he designs a highly functional, very open plan, and sculpts it three dimensionally, creating a form that is reminiscent of architectural precedence without copying it. The result is something unique, with Jacobsen's creative approach, showing through. The facades have a definite rhythm that is intriguing. I am also struck with the ability of Jacobsen to create such an orderly symmetrical form. This requires the plan to be organized within rigid constructs - no easy task. Viewing the interior space one cannot detect that any compromises were necessary to pull this off. Quite the contrary. The interiors are open and dynamic, while still sharing the stylized simplicity of the facades. Like Madeleine Peyroux, Hugh Newell Jacobsen is a contemporary artist of the highest caliber. Both manage to take classic standard which have been "copied" thousands of times, boil them down to their essence, and reinterpret them into something better. They have taken something of a previous time and made it into something of our time. And they continue to do so. Kudos. Interpretation is one aspect of music, composition is quite another. This will be connection to architecture that we'll explore in the next post.....Frozen Music.